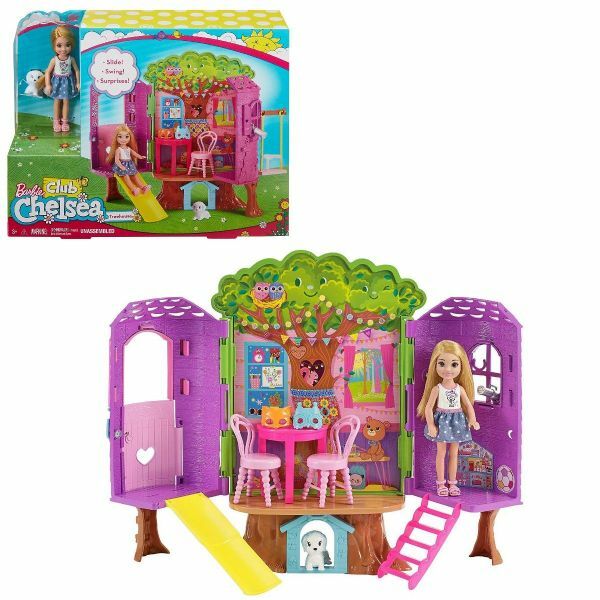 Elevate dollhouse play with Chelsea doll, her puppy and her treehouse play set! The colourful house has five fun zones and pieces to keep imaginations engaged all day. Chelsea doll and her pet puppy can play dress up, eat cupcakes, stargaze, slide, swing and then do it all again. Open the swinging door to the house and send Chelsea doll up the ladder to enter. Then open the sides and climb into storytelling. Kids can play from all angles. A swing on the side has a clip to hold Chelsea doll in place while she swings. Inside, a slide flips down for a fun ride down. There's a table and two chairs where Chelsea doll and her puppy can enjoy a cupcake and juice. Or play dress-up with the two masks. Another room with a window is perfect for stargazing; there's a silvery telescope Chelsea doll can hold in her hand or rest in the window for realistic inspiration. Fun details like a smiling tree backdrop, heart-shaped squirrel cubbyhole decal and tree trunk supports add to the storytelling fun. There's even a doghouse in the trunk where the puppy can take a nap. 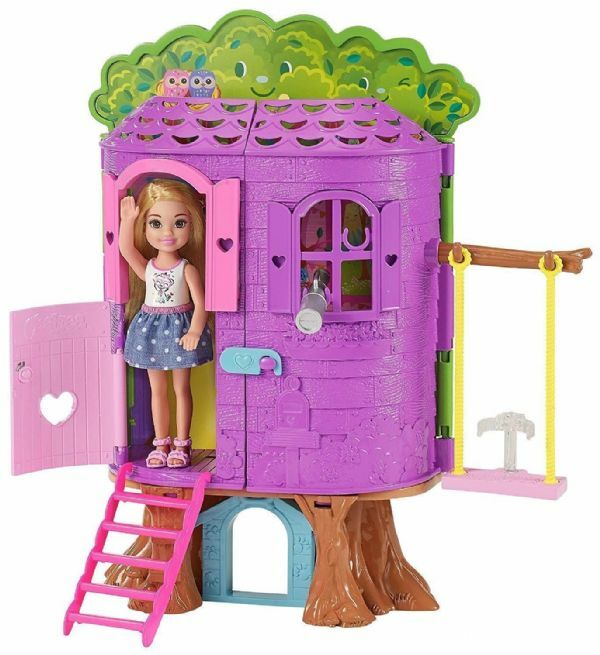 Kids can find so many ways to play and so many stories to tell with this dollhouse that a captures favourite childhood dream of a home among the tree tops. one juice box and a telescope.